River Queen slot game, brought to you by NovomaticCasino.co.uk, is one of our most popular slot games. It has hundreds of positive reviews and is loved by many more, loyal fans. Players of Red Lady, Dolphin’s Pearl Deluxe and Lucky Lady’s Charm Deluxe will enjoy this slot game. It’s quite a historical slot and the design will take you back in time to when people used to travel by boat instead of by plane. You’ll notice from the way the characters are dressed and from the architecture of the buildings of the town in the background. Packed full of symbols, free spins and big wins, River Queen slot game is a fantastic and entertaining game which should go straight to the top of your list of favourite games! The symbols in River Queen slot game are stacked so that they, working together with the 40 winlines, give you so many chances to win! You’ll need to spin at least three matching symbols in River Queen slot game, in order to get a payout. Symbols will need to fall on active winline, in consecutive reels from left to right. Payouts will differ in size and it will all depend on the winning combination you spin and your bet amount. You can choose to bet on all 40 winlines, or less, and you can increase/decrease the amount you want to bet per line by using the plus and minus symbols. The symbols in River Queen slot game include: card values, from 9 to Ace; a stack of gambling chips; a pair of dice; a four-of-a-kind card hand; a well-to-do gambling man and a beautiful lady with a flower in her hair. The beautiful river lady is extra special as she can substitute for all other symbols except the Scatter. The Scatter symbol in River Queen slot game is the boat herself: the River Queen! When you spin three or more of these Scatter symbols in River Queen slot game, you’ll trigger 10 free spins! These free spins include a special feature as well. During the free spins, the Scatter boat symbols which fell on the reels to give you the free spins will stay on their reels, except the reels will flood like a river and the boats will start moving up and down the river! Wherever they stop, they will substitute for all other symbols to give you nice, big wins! 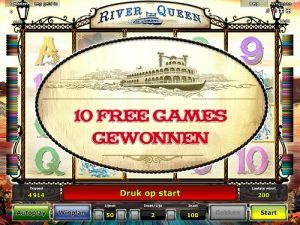 River Queen slot game is a great game for beginners as it’s simple to understand yet entertaining to play. You can play for free if you’d like to practise before you start playing for real! Once you’ve got to grips with the current of the game, you can put the game into ‘autoplay’ and you can stop steering the reels! They’ll spin themselves without you having to keep clicking or giving directions! The best feature is the gamble feature which gives you the chance to turn small wins into massive ones. Get a small win? Make it count! Gamble it to double it! But be careful, it’s a 50/50 chance gamble so you might lose it in the river! Our boat here at NovomaticCasino.co.uk is absolutely filled to the brim with crates and crates of games! Our selection of slots, jackpot slots and video slots is practically never-ending! What’s more, we offer our players the very best table games and live casino games. They’re high-quality and offer high return to player percentages (RTP). Jump aboard and we’ll take you down the river to the most realistic casino experience online!